How is Soft Tissue Lost? Tooth loss or trauma can result in significant deficiency of bone and gum tissue. With receding bone, gum tissue also recedes creating appearance of long teeth and uneven gum tissue. This occurs even more often in patients with thin tissue biotype who have very thin bone and gum tissue to start with. Thin gum tissue has been proved to be a significant contributing factor to tooth loss and peri-implantitis . Gingival tissue with adequate quality and quantity is a requirement for achieving health and aesthetic results around both natural teeth and dental implants. When thin or receded, gingival grafting procedures are recommended to increase the volume and quality of the soft tissue. This improves not only the aesthetics but also makes the teeth easier to clean. In addition, the grafted soft tissue can provide some resiliency to brushing and eating food, protecting the implant and bone beneath. 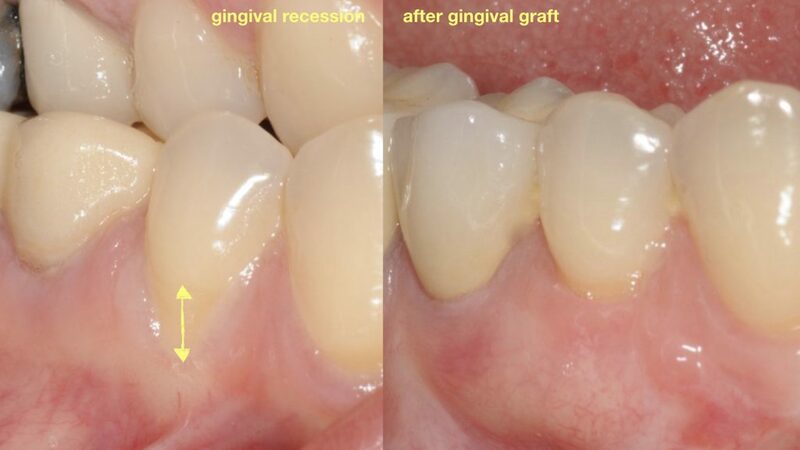 A gingival graft may be used to either increase the zone of attached gingiva (the part of gum tissue closest to the neck of the teeth) or increase its thickness. Soft tissue grafting is very common in the smile zone (where the upper front teeth are) and is often performed at the same time as implant placement. The gum tissue graft is often obtained from the palate (roof of mouth) in either full or partial form. There are also several synthetic materials available for use. Gingival (gum) recession occurs due lack of bone, ‘hard’ brushing, or infection. It is both unaesthetic creating long tooth appearance and also promotes additional bone loss and further destruction of support. Treatments are recommended to restore gingival quantity and quality around teeth or implants providing the aesthetics and functional requirements and longevity. Treatments involve grafting using soft tissue either from the palate or use of several available synthetic materials. 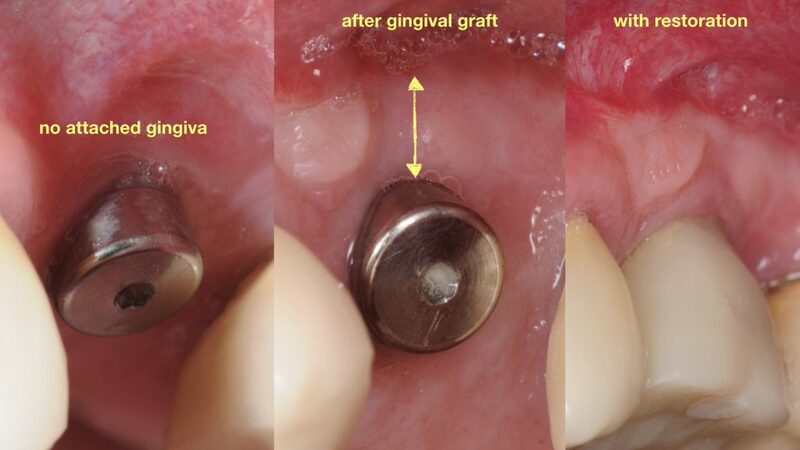 Thin gingiva around teeth or implants results in aesthetic complications, functional challenges, and also increased risk of bone loss and recession. Soft tissue grafting procedures help to restore the proper volume and quality of gum tissue. 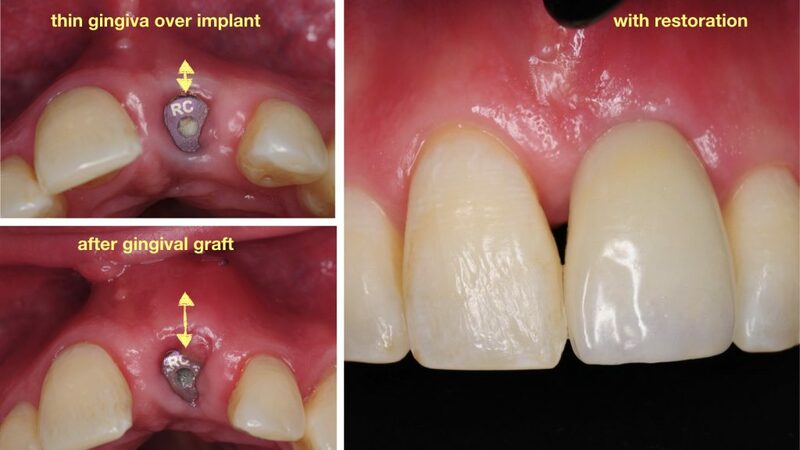 Whether it is on a natural tooth or an existing dental implant with thin tissue, the grafting will improve aesthetics, soft tissue fill, ease of cleaning, and longevity of the tooth or the implant. Attached gingiva is a specific type of gum tissue that has tight adherence to the underlying bone creating a seal around natural teeth or dental implants. This seal is important in stability and health of teeth or implants. When this zone of attached (keratinized) gingiva get thin, patients experience increased irritation, gingivitis, recession, and bone loss. This results in pain and poor aesthetic and functional results. Management involves gum tissue grafts to increase the zone of attached gingiva utilizing either patient’s own tissue from the palate or synthetic materials.